Recent news concerning the testing of the SABRE engine demonstrated the exciting potential of this revolutionary piece of British developed (although ESA funded) technology. Although it is as yet still in its experimental stages, should tests go to plan the Skylon spaceplane for which it is designed could fundamentally transform the launching of satellites and other cargoes into low-Earth orbit. Coming as it did during the same week as the announcement that a private consortium is to take the first steps towards the exploitation of near-Earth asteroids for their raw materials, the era of space exploration could be revitalised, with the economic potential of space beyond low-Earth orbit being explored for the first time. Unlike asteroid mining however, Skylon holds out the prospect of providing a faster return on economic investment. The real potential of the Skylon concept derives from its prospective ability to repeatedly loft cargoes into space for a mere fraction of the current cost owing to the fact that it requires neither booster rockets nor massive amounts of liquid fuel, instead taking much of the fuel that it needs direct from the atmosphere. Estimates suggest that it could cut the cost of satellite launches from £15,000/kg to £650/kg. Moreover, this ability to transport heavy cargo to low-Earth orbit also allows for the possibility of the orbital assembly of spacecraft designed for deep space flight, thereby dramatically reducing the cost both of human and robotic exploration of the Solar System. Skylon could be adapted to transport up to 24 passengers into low-Earth orbit, dwarfing the capability of other existing launch systems as well as the now-retired space shuttle fleet. After the excitement of the Space Race of the 1960s culminating in the Apollo Programme, there has been something of a lull in manned spaceflight, with human missions instead concentrating upon orbits a few hundred miles above our heads in Soyuz capsules, Skylab, Mir and most recently the International Space Station. Although the Obama administration has set the objective of sending a manned space mission way beyond the orbit of the Moon to explore an asteroid, no firm date has been set, and it will not take place until the 2020s at the earliest. Russia and China are currently the only nations capable of sending humans into space. If the investment for Skylon can be found, the UK should be joining them within the next decade or so. It is important that this opportunity to make the country a leading spacefaring nation should not be lost, for it holds significant economic promise. This is the type of project that ought to be supported by funds from the proposed National Investment Bank, thereby providing our people with the opportunity to benefit from supporting productive capital investment in hi-tech industry at home. Our engineering and manufacturing sector needs to be revitalised to secure our long-term economic recovery. It would be a tragedy were the primary beneficiaries to the development of this technology prove to be investors from the Arab petro-states. 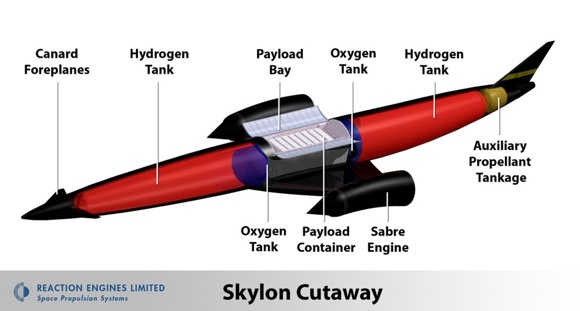 Below is a concept video of the Skylon spaceplane in action.